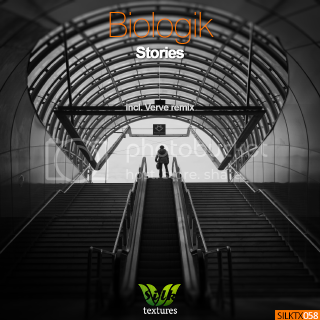 Piping hot Canadian phenom Biologik continues to shine with "Stories", a gorgeous, soul-enriching progressive house cut. His latest composition follows numerous standout releases in recent months on Silk Textures, not to mention his 2013 artist album "Two" [Stellar Fountain], named by Beatport as one of the best albums of 2013. Early on in the Original Mix, a cavernous bassline is joined by echoing vocal chants, which only reinforce the subterranean soundscape. Moody, foreboding pads join the mix, soon followed by the introduction of a stunning verse, delivered by Biologik himself. The groove gets chunkier and a few piano lines add texture, leading up to the main break. The titular vocal hook -- "It's in the stories that we say" -- offers a poignant climax. Australian veteran Verve is a first-time contributor to Silk Textures, but his acclaimed work has been featured on various elite progressive house imprints (including his own FutureForm Music) over the past 5 years. A rolling groove infuses the track with a furious, club-flavored swing. Biologik's vocal is a welcome addition to the soundscape, as is the crescendoing top layer of the bassline, which greatly intensifies the mood. The anticipatory suspense is finally released just past the track's midpoint, when the chugging groove reaches its zenith.